Create your new favorite room with FUNCTIONALITY and STYLE! Horizontal Sliding Windows are available in multiple panel configurations. Our horizontal windows have a different look and functionality than our vertical windows. If your porch window openings are short and wide, horizontal sliding windows may be the best option given the side-to-side operation. Available in frame colors: white, bronze, and driftwood. Style, safety, and flexible design are the cornerstones of the Sunspace Window System. Sunspace Porch Windows are built with the durable View Flex Vinyl Glazing that keeps out the harmful UV rays of the sun. The brass rollers allow for smooth operation, opening each window side-to-side for up to 50% ventilation. 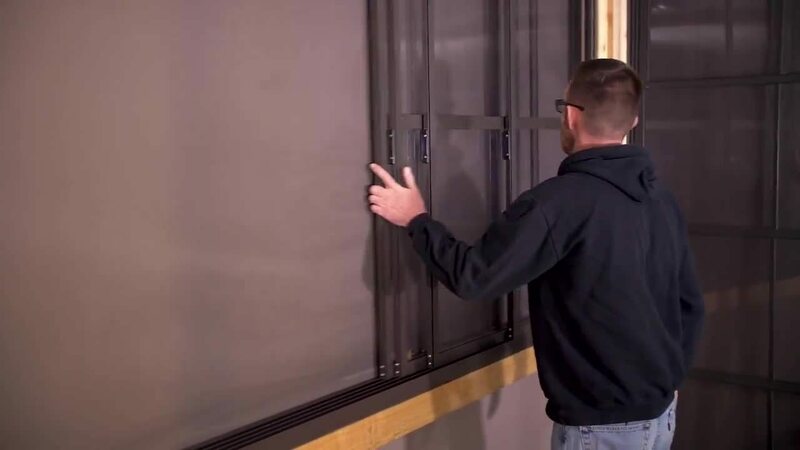 Our window systems are easily installed and can convert any area into your favorite three-season room in the house! You CAN have your dream outdoor living space that remains CLEAN and DRY! These maintenance-free units are custom made to your specifications and can be serviced at any time. Horizontal Sliding Windows are available in 2, 3, or 4-panel configurations. If your porch is more than 30" off the ground, building code dictates that some type of fall protection needs to be implemented. There are quite a few options available for this, below we show the most popular methods. Always consult your local building official as interpretations can vary by municipality. For a porch that is less than 30" off the ground, you can have Sunspace Porch Windows from floor to ceiling without any type of guard rails or fall protection. The sliding panels can collapse down to the floor or be pushed up to the ceiling. This style allows for 75% screen ventilation and the most open views. 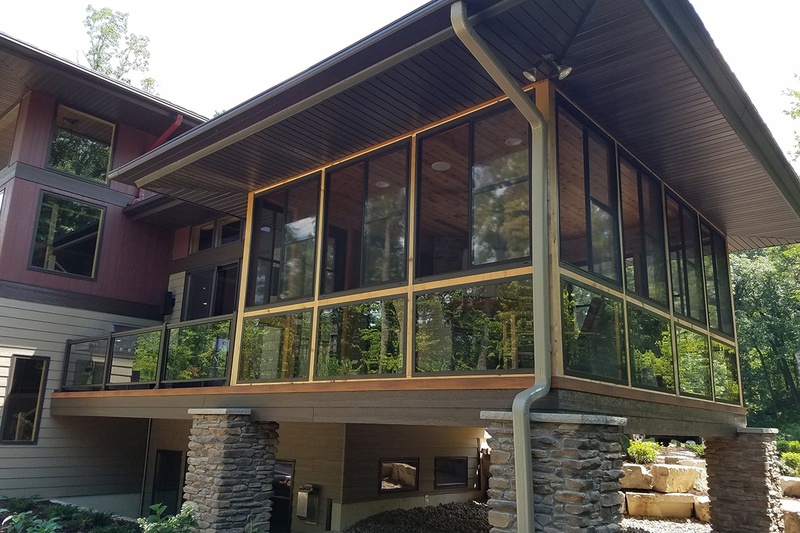 Sunspace Porch Windows can be installed full height (floor to ceiling) to allow for 75% screen ventilation and use a traditional "picket" style of railing to provide for fall protection. The railing is most commonly installed inside of the windows but can be done on the outside as well. In this method, the window panels can drop down behind the railing, or be pushed up to the top. Sunspace manufactures aluminum railings in colors to match the windows, and we can install them together on your porch project. 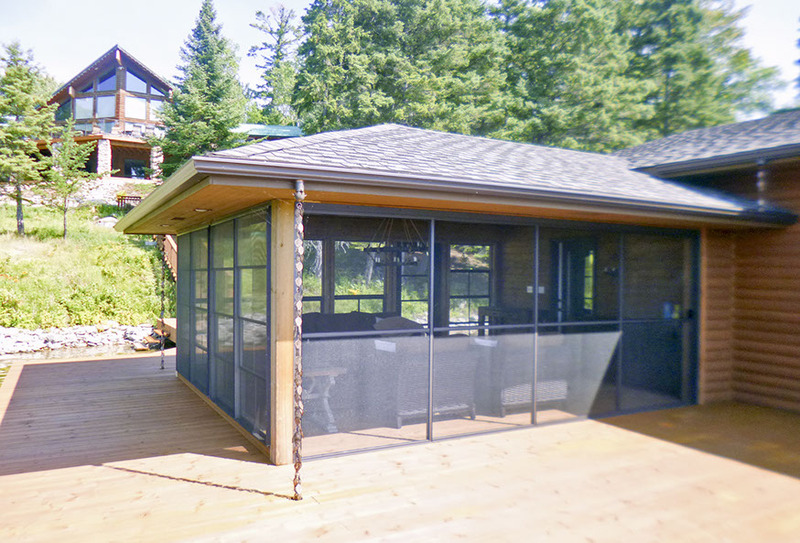 Sunspace Porch Windows can be installed with a fixed panel of tempered glass in the bottom 36" to provide for fall protection. The tempered glass panels do not open and the sliding window panels do not drop down below the 36" height. This results in some loss of ventilation, but does give a great look and open feeling. When the view into your backyard is important, this is the most popular method. The tempered glass panels are manufactured with the same aluminum frames as the operable windows and carry the same lifetime warranty. "I keep singing the praises of the Weather Master Porch Windows and their outstanding customer service. That product and installation is by far the best investment that I’ve made in my 9 + years in my home. My neighbors, friends and family all mention it every time we are all out on the porch enjoying it. I highly recommend the product and the company."